Syrian opposition outlets revealed on January 6 that several commanders of the Free Syrian Army (FSA) are currently in the US capital, Washington, to meet with US officials. The visit was not officially announced by the US or any FSA group. Head of the Political Office of the Mu’tasim Brigade, Mustapha Sejeri, told the Syrian pro-oppositions news outlet ANA Press that the visit is aimed at strengthening the cooperation between the FSA and the US. Sejeri also revealed that fighting “the Iranian influence in Syria” was the main topic during the meeting between the two sides. The Mu’tasim Brigade official also stressed that the FSA is ready to fight Iran in Syria with support from the USA. Moreover, Sejeri said that other points were discussed with the American side including foiling the upcoming National Syrian National Dialogue Conference that will be held in the Russian city of Sochi on January 29. The two sides also discussed the outcomes of Geneva Talks, according to Sejeri. Via Twitter, Sejeri revealed more details and claimed that the FSA and the US also discussed countering the influence of the US-backed Syrian Democratic Forces (SDF) in eastern Syria. Sejeri’s statement was a shock to many Kurdish activists as the Kurdish dominated force is the main ally of the US in Syria. “God willing, our presence in Washington will not only be a reason to end the control of your terrorist militias [SDF] on our regions, but will also be the beginning of the end of the Iranian presence on our soil, and the failure of the treachery conference in Sochi,” Sejeri tweeted in response to a Kurdish activist who criticized the FSA commanders’ visit to Washington. 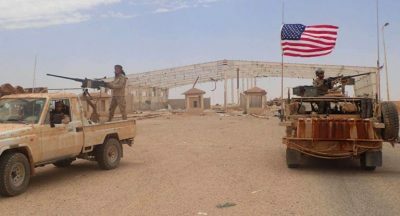 The FSA visit to the US was criticized by many Syrian Kurdish activists, with some even accusing Washington of betraying the Kurds because the US never invited any SDF officials to Washington. Meanwhile, Syrian pro-government activists viewed the visit as another attempt by Washington to destabilize the situation in Syria and reignite the war that slowed down after the de-facto defeat of ISIS. The visit was the first since the war broke out in Syria in 2011. However, many US official including Senator John McCain and former US ambassador to Syria Robert Ford had met with FSA commanders inside Syria on several occasions.